He is a horse who has always shown plenty of ability so it was pleasing to see War Legend (pictured) win in such impressive fashion at Pakenham on Thursday evening. Having only his second run back from a spell - and appreciating a step up to 1600m - the son of Rip Van Winkle settled back for Ryan Maloney but he was always travelling well, his rider impressed with the way he settled. "He was known to reef and pull last time in but he relaxed beautifully for me today," he said. Hooking out wide into the straight, War Legend really knuckled down over the final stages, hauling in the leader late - in doing so recording his second win from just nine starts. Stakes placed last spring, War Legend still has a bit to learn said Maloney who described the bay as "tough as nails." "The penny hasn't quite dropped yet and there is still nice improvement in him." Hopefully the winners will continue to roll over the next few days and we kick off a busy time with Gold Kroner at Kilmore on Friday. Having his first run since the spring, the handsome son of Choisir has been shaping nicely this time in and Moroney is confident that he is well placed first up - "he has struck the right sort of race for him and he is forward enough to run a good race." Later in the day we saddle up three runners at Moonee Valley, the first of whom is Beyond Purple in the second event, a 1000m event for three-year-old fillies. "She is a very smart filly," Moroney enthused. "She has struck a competitive race but we expect her to run really well." In the seventh event, the EJ Whitten Foundation Tour Of Victoria Distance Final, we are represented by two nice horses; Margin Trader and Space. The former jumps from barrier two which is not ideal, the Tavistock four-year-old "not a smart beginner." "But we have Damien Oliver aboard and so long as he puts himself in the race he is a good chance." Space meanwhile is to be ridden by Glen Boss and whilst he is up in class he strips fitter for recent racing - "he has been improving with each run," Moroney said. Alaskan Rose is our only runner at Caulfield on Saturday and we are looking forward to seeing how she performs in the Gr.2 Angus Armanasco Stakes. 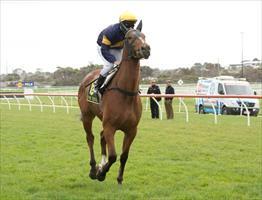 "She has drawn out which is not a bad thing as she just didn't look happy on the fence last start," said Moroney. "But she was not far off them at the finish and we have been really impressed with how much more relaxed she is this time in compared to her first preparation." Also competing on Saturday is Lord Disick who lines up in the opening event at Randwick, the All Too Hard Handicap over 2400m. "He has been up a while but he will be better for his last run over the distance and it looks the same sort of field. He should prove competitive from a nice gate." Keen Desire is another of our Saturday runners, the lightly raced Wanted filly looking to break her maiden at her third outing. "She is bred to spring but she has been racing as though looking for further so she looks suited up i distance - and she has improved."